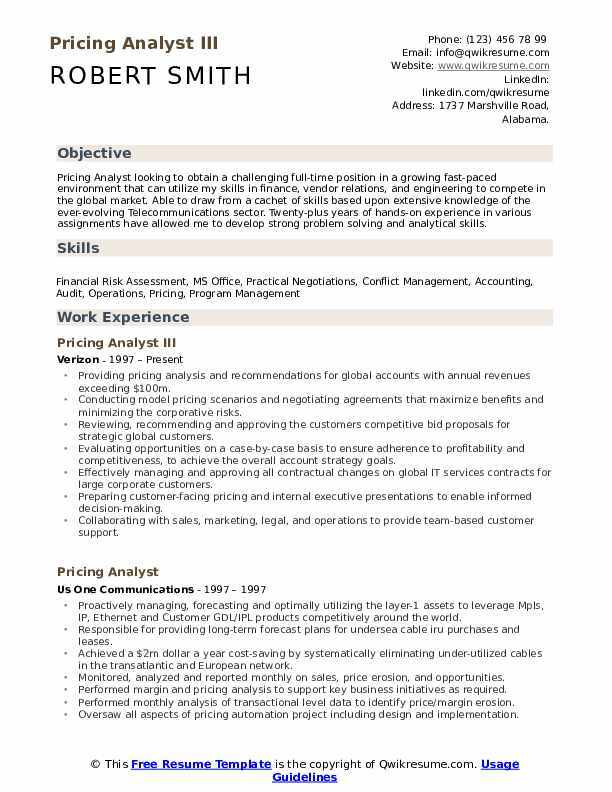 The responsibilities of a Pricing Analyst are to prepare presentations and present them to the senior management, work with spreadsheets loaded with financial data, involve in contract-related negotiations, respond to the price quotes given by other parties, and prepare a report of the market trends weekly or monthly or as required by the business authorities. 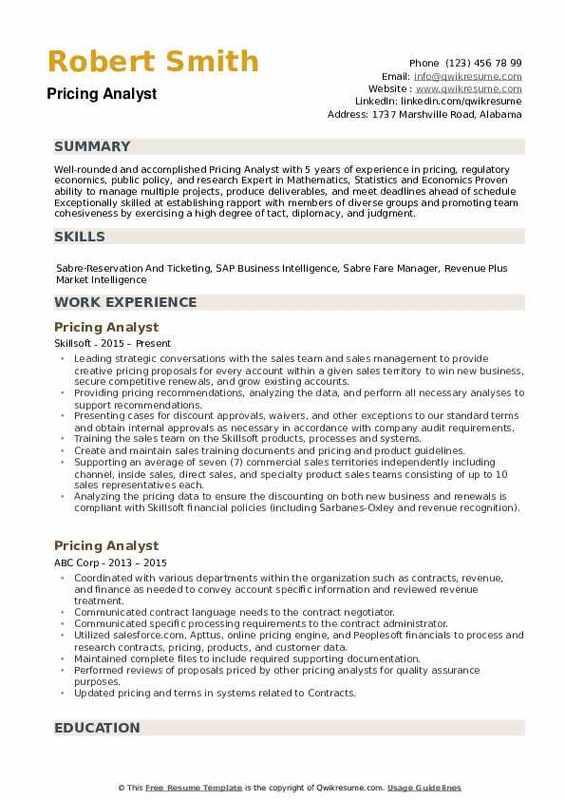 The skills required for a Pricing Analyst include analytical and presentation skills, awareness of the economic trends and the factors influencing them, and thorough knowledge of computer software such as spreadsheets. Finance graduates with an eye for detail and interest to keep updated with market trends can consider taking the role of a pricing analyst. 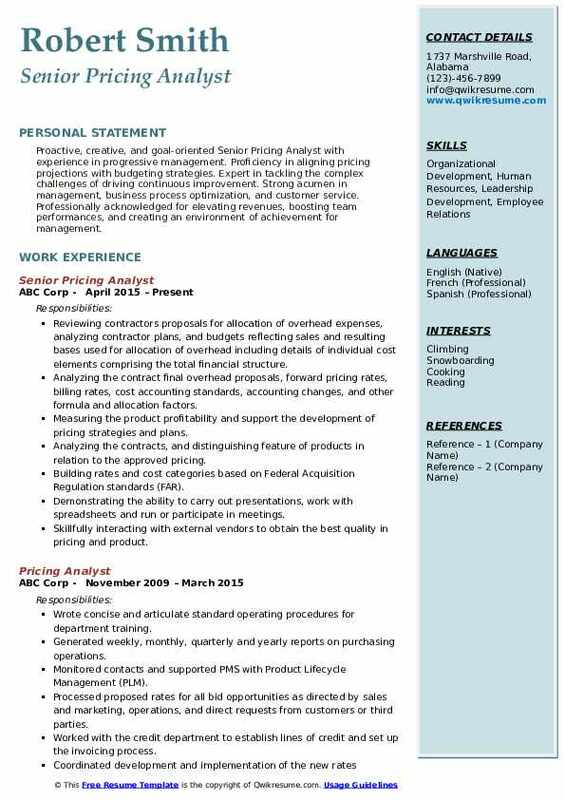 Start your job search by preparing a Pricing Analyst Resume sample according to the guidelines suggested here. The educational qualifications required for a pricing analyst role are a bachelor’s degree in finances, statistics, or economics. 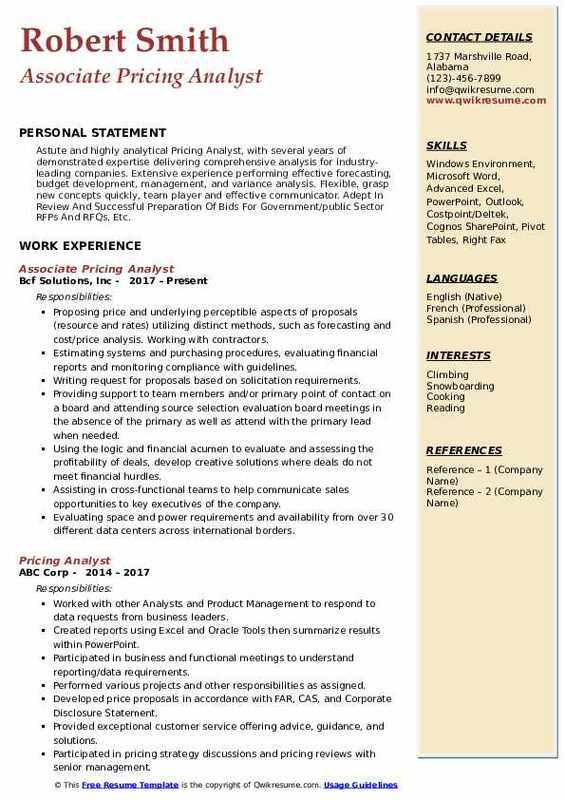 Summary : Pricing Analyst looking to obtain a challenging full-time position in a growing fast-paced environment that can utilize my skills in finance, vendor relations, and engineering to compete in the global market. Able to draw from a cachet of skills based upon extensive knowledge of the ever-evolving Telecommunications sector. Twenty-plus years of hands-on experience in various assignments have allowed me to develop strong problem solving and analytical skills. Providing pricing analysis and recommendations for global accounts with annual revenues exceeding $100m. Conducting model pricing scenarios and negotiating agreements that maximize benefits and minimizing the corporative risks. Reviewing, recommending and approving the customers' competitive bid proposals for strategic global customers. Evaluating opportunities on a case-by-case basis to ensure adherence to profitability and competitiveness, to achieve the overall account strategy goals. Effectively managing and approving all contractual changes on global IT services contracts for large corporate customers. Preparing customer-facing pricing and internal executive presentations to enable informed decision-making. Collaborating with sales, marketing, legal, and operations to provide team-based customer support. Improving vendor relations, through open communication on all open issues. Providing benchmarking information that leads to sound decisions on the highest quality of services. Summary : Highly analytical, results-driven Senior Pricing Analyst who works quickly and accurately under tight deadlines with a reputation for dependability and integrity. Extensive knowledge of PeopleSoft. Extensive experience with most ERP systems: COGNOS, Oracle, SAP, JD Edwards, and Hyperion. Responsible for analyzing and preparing all invoicing across complex business groups on a daily basis. Responsible for the release of annual fees to all accredited organizations by the first. Business day of each year, equaling approximately 16,000 invoices and $60 million in revenue. Worked this process from development stage in October of each year through. Developed and posted the pricing schedule for all accreditation services to internal and. Responsible for all pricing quotes for all new and current business based on the business. Managed and billed all government contracts according to contract terms, guidelines and regulations. Developed tracking to share info with the Contract Officer. Assisted the Contracting Officer in pricing bid requests for new business. Met monthly target goals of completing all invoices within 5 business days. Worked on multiple systems tracking and using customer information such as applications and scheduling software. 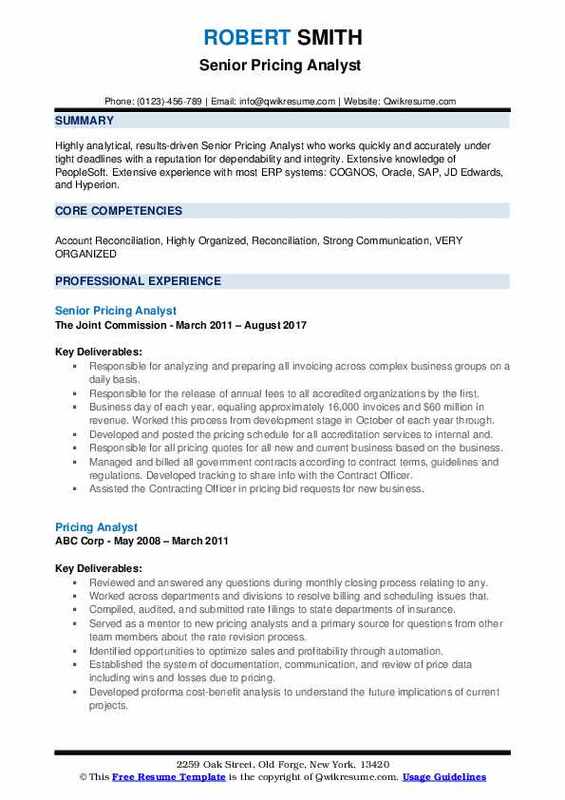 Summary : Pricing Analyst I with almost 14 years of company experience. 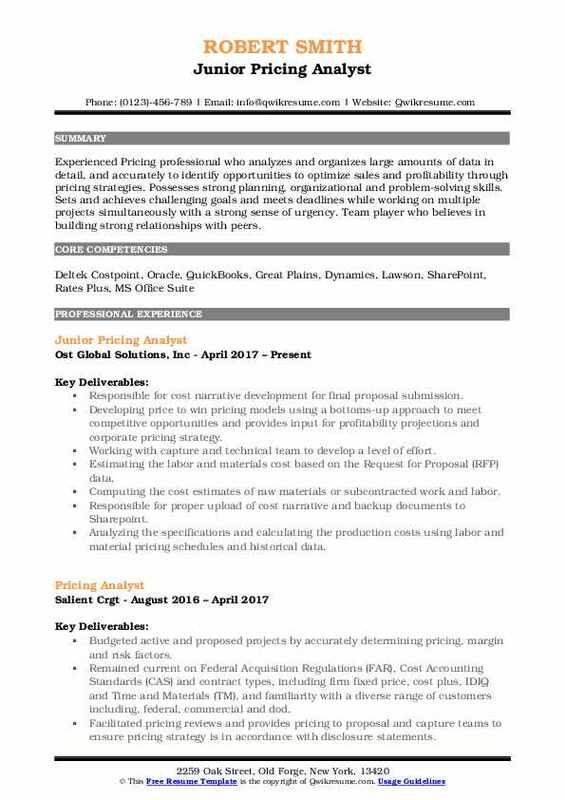 Looking to leverage my experience and skill set to fill the position of Sr Pricing Analyst. Documented record of strong, decisive and executive leadership. Results-proven, a growth-oriented leader with repeated success in multiple industries and markets, building shareholder value and achieving strategic goals. Responsible for supporting the sales force by both retaining and growing volume and revenue for ups. Providing competitive rates and effective pricing strategies that both maximize profitability and favorably position ups in the marketplace. Evaluating and analyzing pricing requests to ensure that request information from the field is accurate and complete. Collaborating with sales and pricing personnel to gather critical information. Running queries on current contracts, volume, and rates to determine the pricing needed to win or retain business. Developing the pricing strategies and discounts, while evaluating competition and market conditions to formulate appropriate and profitable sales/pricing strategies. Leading quote reviews to VP and Senior Level Managers for transportation opportunities $5mm and greater. Completing ad-hoc analysis showing the financial impact of different pricing scenarios. Completing and submitting the bid acceptance checklists, bid response forms, signed copies of contracts or addendums, bid worksheets, and cost summaries to the administration group for implementation. 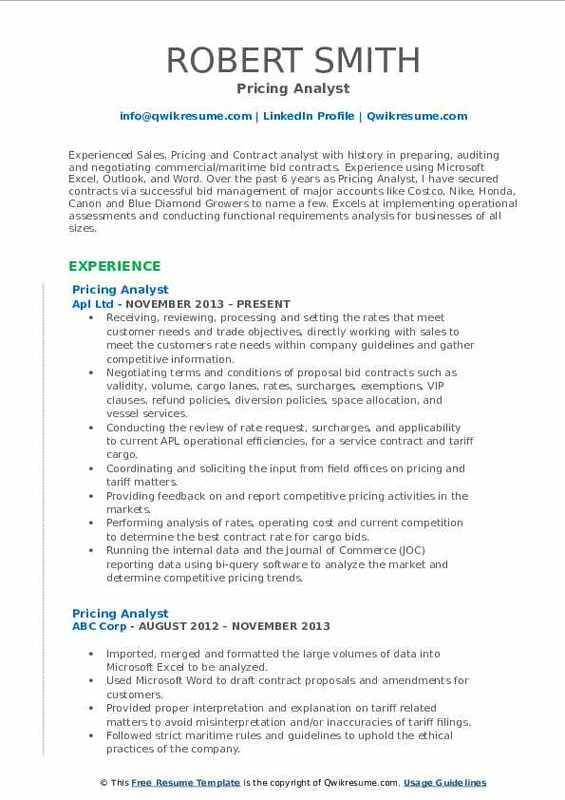 Headline : Experienced Sales, Pricing and Contract analyst with history in preparing, auditing and negotiating commercial/maritime bid contracts. Experience using Microsoft Excel, Outlook, and Word. Over the past 6 years as Pricing Analyst, I have secured contracts via successful bid management of major accounts like Costco, Nike, Honda, Canon and Blue Diamond Growers to name a few. Excels at implementing operational assessments and conducting functional requirements analysis for businesses of all sizes. Receiving, reviewing, processing and setting the rates that meet customer needs and trade objectives, directly working with sales to meet the customers' rate needs within company guidelines and gather competitive information. Negotiating terms and conditions of proposal bid contracts such as: validity, volume, cargo lanes, rates, surcharges, exemptions, VIP clauses, refund policies, diversion policies, space allocation, and vessel services. Conducting the review of rate request, surcharges, and applicability to current APL operational efficiencies, for a service contract and tariff cargo. Coordinating and soliciting the input from field offices on pricing and tariff matters. Providing feedback on and report competitive pricing activities in the markets. Performing analysis of rates, operating cost and current competition to determine the best contract rate for cargo bids. Running the internal data and the Journal of Commerce (JOC) reporting data using bi-query software to analyze the market and determine competitive pricing trends. Summary : Proactive, creative, and goal-oriented Senior Pricing Analyst with experience in progressive management. Proficiency in aligning pricing projections with budgeting strategies. Expert in tackling the complex challenges of driving continuous improvement. Strong acumen in management, business process optimization, and customer service. Professionally acknowledged for elevating revenues, boosting team performances, and creating an environment of achievement for management. Reviewing contractors proposals for allocation of overhead expenses, analyzing contractor plans, and budgets reflecting sales and resulting bases used for allocation of overhead including details of individual cost elements comprising the total financial structure. Analyzing the contract final overhead proposals, forward pricing rates, billing rates, cost accounting standards, accounting changes, and other formula and allocation factors. Measuring the product profitability and support the development of pricing strategies and plans. Analyzing the contracts, and distinguishing feature of products in relation to the approved pricing. Building rates and cost categories based on Federal Acquisition Regulation standards (FAR). Demonstrating the ability to carry out presentations, work with spreadsheets and run or participate in meetings. Contacting the location Managers and Department Supervisors to assess requirements. 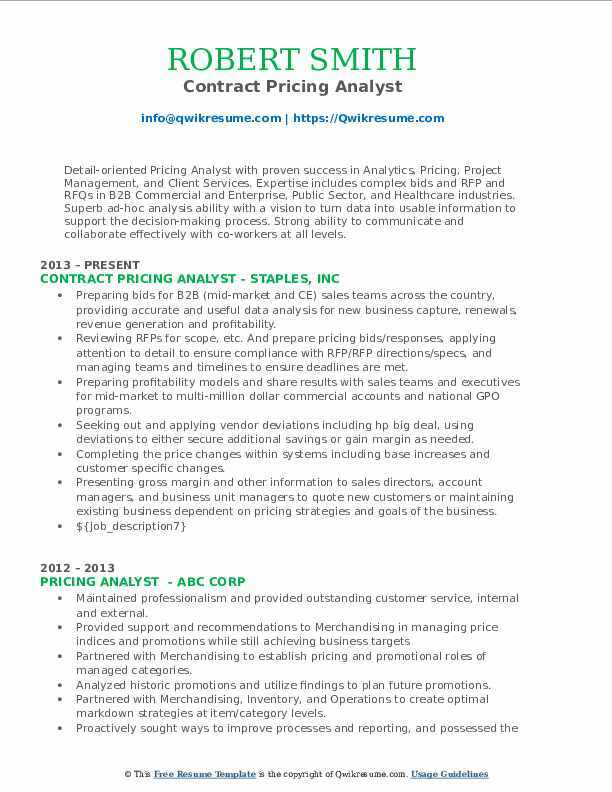 Summary : Knowledgeable Pricing Analyst I with 13 years of experience in pricing strategy development, revenue management, and financial planning & analysis, with multiple industries and pricing platforms. Power User with Excel and Access. Superior spreadsheet modeling, data manipulation, and database administration skills. Commanding knowledge of advanced functions such as pivot tables, V and H lookups, macros, and visual basic. Created successful pricing models and proposals which have significantly grown. Managed the RFP for the divisions largest customers. Created and implemented strategies to identify mode conversion opportunities to reduce the customer spend and increase profitability (primarily OTR to intermodal). Developed a standardized pricing template that is used by the entire pricing and sales team, which takes into account the disparity between actual fuel spend and recovery. Developed and implemented a multiphase new customer implementation program, which streamlined the transition of new customers from award to operation. Identified areas of profit loss due to operational inefficiencies and developed programs to train operation representatives to identify these opportunities to increase both profitability and customer retention due to rate reductions. Created successful modal conversion models that increased profitability and decreased the customer spend by transitioning high volume inland international shipments to port. Headline : Detail-oriented Pricing Analyst with proven success in Analytics, Pricing, Project Management, and Client Services. Expertise includes complex bids and RFP and RFQs in B2B Commercial and Enterprise, Public Sector, and Healthcare industries. Superb ad-hoc analysis ability with a vision to turn data into usable information to support the decision-making process. Strong ability to communicate and collaborate effectively with co-workers at all levels. Preparing bids for B2B (mid-market and CE) sales teams across the country, providing accurate and useful data analysis for new business capture, renewals, revenue generation and profitability. Reviewing RFPs for scope, etc. And prepare pricing bids/responses, applying attention to detail to ensure compliance with RFP/RFP directions/specs, and managing teams and timelines to ensure deadlines are met. Preparing profitability models and share results with sales teams and executives for mid-market to multi-million dollar commercial accounts and national GPO programs. Seeking out and applying vendor deviations including hp big deal, using deviations to either secure additional savings or gain margin as needed. Completing the price changes within systems including base increases and customer specific changes. Presenting gross margin and other information to sales directors, account managers, and business unit managers to quote new customers or maintaining existing business dependent on pricing strategies and goals of the business. 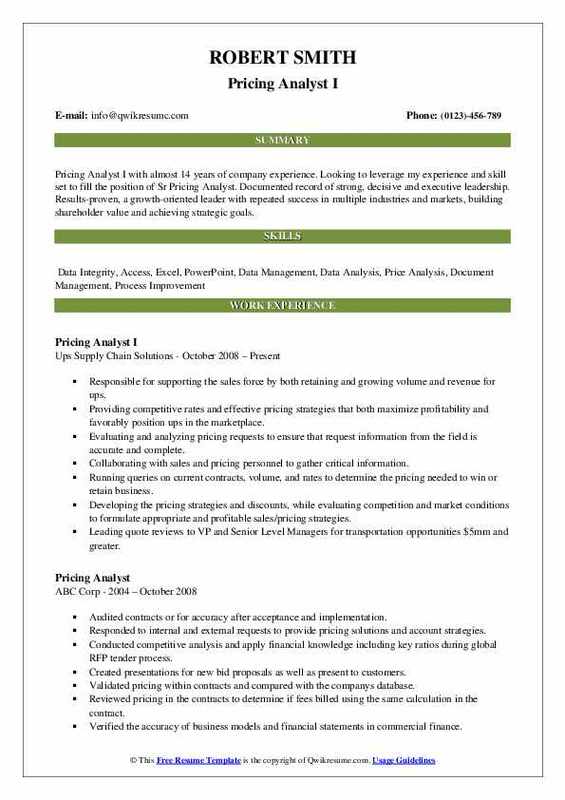 Objective : Experienced Pricing professional who analyzes and organizes large amounts of data in detail, and accurately to identify opportunities to optimize sales and profitability through pricing strategies. Possesses strong planning, organizational and problem-solving skills. Sets and achieves challenging goals and meets deadlines while working on multiple projects simultaneously with a strong sense of urgency. Team player who believes in building strong relationships with peers. Responsible for cost narrative development for final proposal submission. Developing price to win pricing models using a bottoms-up approach to meet competitive opportunities and provides input for profitability projections and corporate pricing strategy. Working with capture and technical team to develop a level of effort. Estimating the labor and materials cost based on the Request for Proposal (RFP) data. Computing the cost estimates of raw materials or subcontracted work and labor. Responsible for proper upload of cost narrative and backup documents to Sharepoint. Analyzing the specifications and calculating the production costs using labor and material pricing schedules and historical data. Preparing the cost reports and presenting findings to management, contract personnel, proposal coordinators, customer representatives, price auditors, vendors, and subcontractors. 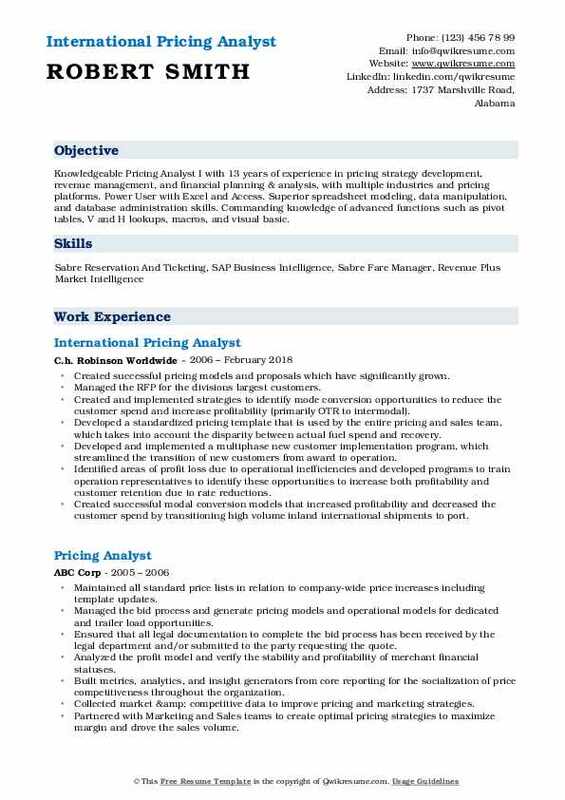 Objective : Astute and highly analytical Pricing Analyst, with several years of demonstrated expertise delivering comprehensive analysis for industry-leading companies. Extensive experience performing effective forecasting, budget development, management, and variance analysis. Flexible, grasp new concepts quickly, team player and effective communicator. Adept In Review And Successful Preparation Of Bids For Government/public Sector RFPs And RFQs, Etc. Proposing price and underlying perceptible aspects of proposals (resource and rates) utilizing distinct methods, such as forecasting and cost/price analysis. Working with contractors. Estimating systems and purchasing procedures, evaluating financial reports and monitoring compliance with guidelines. Writing request for proposals based on solicitation requirements. Providing support to team members and/or primary point of contact on a board and attending source selection evaluation board meetings in the absence of the primary as well as attend with the primary lead when needed. Using the logic and financial acumen to evaluate and assessing the profitability of deals, develop creative solutions where deals do not meet financial hurdles. Assisting in cross-functional teams to help communicate sales opportunities to key executives of the company. Evaluating space and power requirements and availability from over 30 different data centers across international borders. Headline : Well-rounded and accomplished Pricing Analyst with 5 years of experience in pricing, regulatory economics, public policy, and research Expert in Mathematics, Statistics and Economics Proven ability to manage multiple projects, produce deliverables, and meet deadlines ahead of schedule Exceptionally skilled at establishing rapport with members of diverse groups and promoting team cohesiveness by exercising a high degree of tact, diplomacy, and judgment. Leading strategic conversations with the sales team and sales management to provide creative pricing proposals for every account within a given sales territory to win new business, secure competitive renewals, and grow existing accounts. Providing pricing recommendations, analyzing the data, and perform all necessary analyses to support recommendations. Presenting cases for discount approvals, waivers, and other exceptions to our standard terms and obtain internal approvals as necessary in accordance with company audit requirements. Training the sales team on the Skillsoft products, processes and systems. Create and maintain sales training documents and pricing and product guidelines. Supporting an average of seven (7) commercial sales territories independently including channel, inside sales, direct sales, and specialty product sales teams consisting of up to 10 sales representatives each. Analyzing the pricing data to ensure the discounting on both new business and renewals is compliant with Skillsoft financial policies (including Sarbanes-Oxley and revenue recognition).